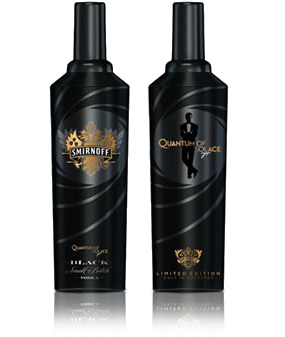 Diageo-owned Smirnoff Vodka has announced its official partnership with the world's most famous secret agent in the next James Bond film, Quantum of Solace, which is set for global release in November 2008. The partnership will see James Bond-inspired initiatives from Smirnoff in markets worldwide. The promotional campaign begins in October 2008 with the Travel Retail Smirnoff Black limited-edition cocktail shaker at the heart of the campaign. The stainless steel cocktail shaker encases a 70cl bottle of Smirnoff Black vodka. Diageo GTME Marketing Director Nick Robinson said the campaign would provide "exceptional support" to the Smirnoff brand and enhance the in-store experience: "James Bond and Quantum of Solace provide the ideal opportunity to reach our key target market and enhance perceptions of the brand. This powerful campaign emphasises the premiumisation potential across our vodka portfolio in the year ahead." The global marketing campaign will include a broadcast advertising campaign, on- and off-premise promotions, a public relations campaign and digital campaign linked to the Smirnoff website (www.smirnoff.com). "Almost half a century since the debut of the 'shaken not stirred' vodka martini, Smirnoff and James Bond are still the perfect match: two bold, iconic brands that epitomise originality and authenticity," said Diageo Global Senior Vice-President Philip Gladman. "This renewed partnership gives vodka drinkers around the world a taste of the Bond lifestyle, from cocktails to prestigious VIP premieres." Produced by Michael G Wilson and Barbara Broccoli for EON Productions and distributed by Sony Pictures Entertainment, Quantum of Solace follows the last Bond film, Casino Royale, in which Smirnoff was also an official partner. The partnership marks almost 50 years of collaboration between the SmirnoffF brand and the 007 franchise. The brand made its original appearance alongside Bond in Dr No, the first James Bond movie, which premiered in 1962. Sean Connery's request for a "martini, shaken not stirred" made with Smirnoff vodka helped change how people made 007's favourite cocktail-from using traditional gin to making it vodka-based. Inspired by Quantum of Solace, The Quantum of Solace and The Black Martini are the newest Smirnoff cocktails.